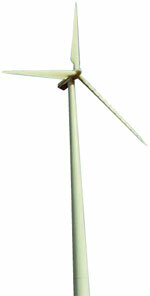 OVER the years, wind turbines have been favoured as one of the most promising renewable sources of energy. But it may come at a cost. This pollution-free and environment-friendly source of energy can cause an increase in local temperatures. Researchers from University at Albany in the US, led by Liming Zhou analysed land surface temperature data of west-central Texas between 2003 and 2011 using instruments on board NASA’s Aqua and Terra satellites. The Texas region in the US has four of the world’s largest wind farms. The number of wind turbines has increased from 111 in 2003 to 2,358 in 2011. The area does not have any other developmental activities which can contribute to temperature rise. The analysis of data showed an upward trend in temperatures during the nine years, consistent with the increasing number of operational wind turbines. The land surface temperature increased at a rate of 0.72°C per decade during the study period relative to nearby regions without wind farms. The reason behind this, researchers suggest, is that the turbines act as fans which pull the warmer air higher in the atmosphere to the surface and cooler air from the surface higher up at night. This pushes up the overall temperature. Under normal circumstances, at night when the sun goes down and the earth cools the air closer to the ground becomes colder. The study was published in the April 29 issue of Nature Climate Change. “The research is a first step in exploring the potential of using satellite data to quantify the possible impacts of wind farms on weather and climate,” says Zhou. “We are now expanding this approach to other wind farms too,” he adds. Somnath Baidya Roy, co-author of the study, notes that the study is important as understanding the impacts of wind farms will help in developing efficient adaptation and management strategies to ensure long-term sustainability of wind power. Vinay Shankar Prasad Sinha, associate professor of remote sensing at Banasthali University in Rajasthan, points out that the impact of wind turbines on local temperatures may vary with geographical locations and this needs to be studied further. Non sense. If this were true, the wind turbines in the Netherlands would have made it the hottest European State considering the long history of the presence of the wind mills there. This observation is very akin to one I read that said, the rates of suicides in Japan are higher compared to any of the African countries and the reason attributed was that the people in Africa eat sorghum, which is rich in magnesium, which the Japanese do not consume in as much quantities.